Brace yourself for some exciting news! Not only is today a book review and interview, but we are giving away A GALLON OF TACKY GLUE! 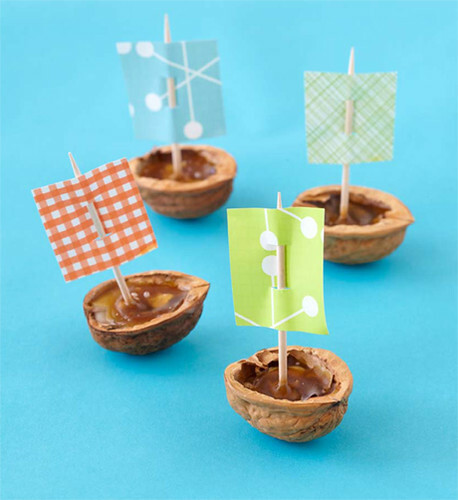 The crafty possibilities are endless! 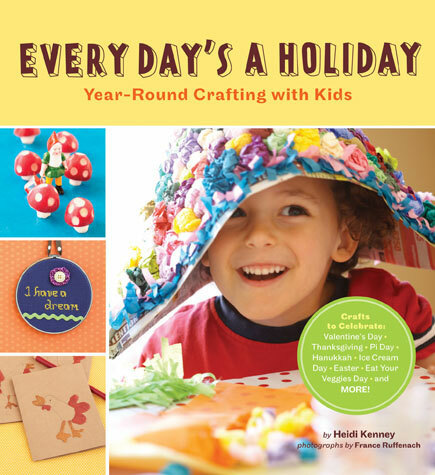 It seemed an appropriate prize since throughout Heidi Kenney's adorable new book Every Day's a Holiday Year-Round Crafting with Kids she mentions using Tacky Glue for projects like Gingerbread House Tissue-Box Covers and Felted Love Bugs. If these projects have you intrigued then you are going to want to run right out and snag yourself a copy of Every Day's a Holiday. 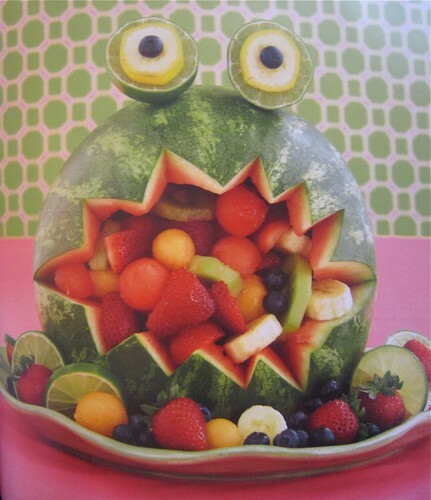 Even if you don't have kids to craft with heck I'd wear the adorable Erin Go Bragh Leprechaun Pin and happily serve the Watermelon Monster at any party for adults or kids. Every Day's a Holiday has oodles of projects I can't wait to make with Tallulah (read the interview for her suggestions on toddler crafts). There are several projects that strike a cord with me creatively. If Heidi's Cool Ice Cream Cone and Punxsutawney Phil Shadow Puppet had a baby it would be my Groundhog Day Pop Up Puppet. The Prize Winning "Pi" Pie celebrating Pi Day in May satisfies my love of prize ribbons perfectly! 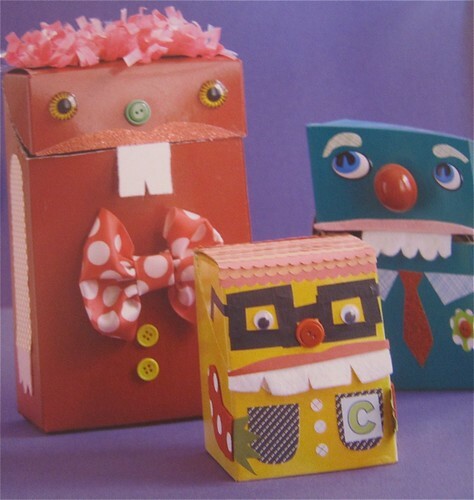 The Recycled Mini Robots seem like a much more kid friendly version of the tin can robots I made with my mom that perhaps I could conquer with Tallulah some day. 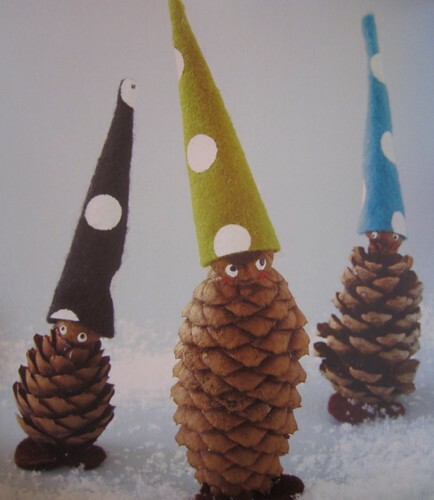 The Woodland Gnomes and their pointy polka dotted hats makes me want to revamp my Parisian Pine Cone People stat. 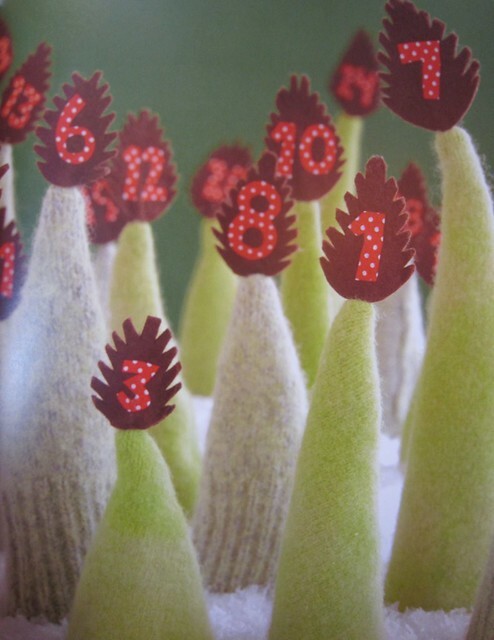 I am drawn to so many of the cute projects I could go on for days, but I won't. Let's get on with our interview. Heidi Kenny is an old school crafter who has been 'making' long before Etsy was a glimmer in a Brooklynites eye. Her website My Paper Crane made doughnut shaped plushies a household name. Her fantastic art and crafts can be seen in galleries, craft fairs and books across the country. Read on for more inside scoop! I know for me since the birth of my daughter my interest in crafting and decorating for holidays has gone way up. Was that the case for you or have you been decorating for Arbor Day since you were a teen? I would say I have always loved celebrating, and crafting so for me those always went hand in hand. I remember one time as a pre-teen I made the whole family New Year's Eve hats, noisemakers (that didn't work so well), and confetti. I remember just really wanting everyone to be into it, and they really weren't haha. I will say that having kids has been great for my love of crafting for the holidays because they are always game. What is your favorite holiday to decorate and craft for? I’m a fan of Halloween myself. My most favorite holiday is Christmas, and Halloween is a close second. We go a little nuts around our house with decorations for both. When writing Every Day’s a Holiday did you experience any craftnical difficulties? I know for my book The Naughty Secretary Club there were a few projects that I wanted to make, had the plan in mind and then when it came to executing that idea I could not make it work and had to scrap it. Yeah, I had this great idea for a pillow for Halloween. I felt like I was being really clever too in thinking up a technique I had never seen before (although that doesn't mean someone else hasn't already done it) I had the idea to embroider a jack o lantern using black wool yarn onto a square cut from an all wool orange sweater. Then I figured you could felt the whole thing! It worked okay, but the design wasn't exactly as I was expecting. I still hope to try again some day. For those of us with young kids, toddler range, what are some of the best projects in Every Day’s a Holiday to do with the kiddlets? For toddlers I think projects like the recycled card board flowers for Spring Equinox could be a good project. If mom or dad cuts out all the flower shapes, your little one can arrange the actual flowers, and then you can help with gluing them down. Also the seed keeper pouch for Johnny Appleseed is fun for young ones because they can stamp down the apple, and it's pretty fool proof. The ribbon bows in the back are another way you can work together with your toddler. They scribble and color the paper, which the adult can then cut up and glue into the bow. I see that you have started getting into fabric design (some of the cutest fabric I have ever seen I might add) do you prefer making tangible things like the plushies you were first known for or the graphic design side of things like fabrics? Thanks so much, the fabric designing has been such a fun new thing for me. I'd really say I go through moods. Some times I really feel like sewing plush, and some times I like working better with paper. Most of my fabric designs are used by cutting and layering color paper into the actual characters and then scanning them into my computer. When writing your book were there any months that were harder to come up with projects for than others? When I am writing my own weekly how-to projects it seems some months are busting at the seams with holidays while others are pretty holiday light. Yes, I found that August and September were tricky ones for me, and we actually had to even combine them in the book. I remember at Christmas time we used to make reindeer pins out of clothespins and felt, and at Easter we made pom pom chicks with googly eyes. Both my parents were crafty, so we made a lot of stuff growing up. I noticed lots of the projects from Every Day’s a Holiday are edible: Marzipan Doughnuts, Mini Radish Mushrooms, Pinecone Cheese Balls and more. This is a two fold question – if you were going to chef school would you specialize on the savory or sweet side of things? Second do you mind sharing a go-to recipe you use with your family. If I were to go to chef school I would have to go with the sweet. I love the way sweet foods lends itself to cuteness and colors. Meanwhile in a saucepan over medium heat melt the butter and then add flour. Stir until fully combined. Next add the milk and let it heat up until the butter/flour has all combined. Then add the cheese and lower heat to low. Stir the mixture now and again until cheese is al melted and the cheese sauce looks nubbly. Drain noodles, and add to cheese sauce. Pour the mixture into a casserole dish and bake for 30 mins. I am a firm believer in the family that crafts together stays together. My mother, sister and I still craft together and always have great creative synergy. I’m trying to instill those same ideas with my daughter. Why do you think it is important to introduce kids to crafting? I agree, I grew up making things and I think it kept our whole family close. My sisters and I have such great memories of crafting. I think it also is just a special time to sit down with your kids and make something. With the world changing and technology everywhere, there is just something so great about working together to make something with your own hands. What does the future hold for Heidi Kenney? Any new fabric designs on the horizon? Have you inked a deal with Chronicle for a slew of new books? I adored the plush jewelry on your website – any more wearable plans? While I don't have anymore book plans just yet, I would love to do something with theme parties. I have a possible line of goods coming out with a company I have not worked with before. I am also continuing to work with Kidrobot and have a bunch of new goodies with them releasing in March of next year. The jewelry I made was for a wearable art show, and so much fun. I'd love to try making some more.